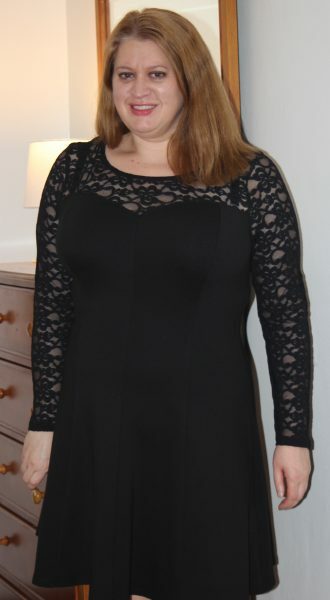 Holiday look number three from Bravissimo is the Jessie Skater Dress in black. The dress is constructed with princess seams and has a black lace yoke and sleeves. It’s a stretch jersey dress so super comfortable. However, the stretch lace does seem like it has the potential to snag. This dress is fun and flirty and definitely a great little black dress for the holiday season. I am wearing size 14 RSC (18 in UK Sizing). I’m 5’7 and my measurements are 48-39-44. Are of any you searching for a new little black dress? I am loving your Bravissimo reviews! Your photos are better than the store ones, more detail and a better indication of fit, plus you are a more realistic size and shape. You look lovely in this black dress and in the red dress and black cardigan. Thank you, I might have to buy the cropped cardio myself. I love the cropped cardigans from Bravissimo. I wore the white one all summer. I’m happy you are enjoying my reviews.